If you are renewing your passport for the first time, you might wonder what will happen with your old passport. The old passport you submitted with your passport renewal request will be marked cancelled, even if it is already expired, and it will be returned to you. 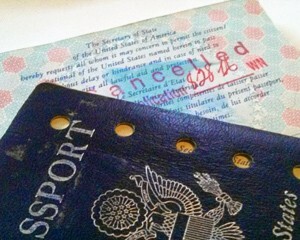 Passport books can be marked cancelled with a stamp or by having holes punched in the cover. If you also submitted a passport card, it will be cancelled by having one corner snipped off. Don’t be surprised if your cancelled passport arrives in the mail after your new passport, in a separate envelope. What should I do with my Cancelled Passport? You might think that it’s a good idea to shred or destroy your old passport, the way that you cut up your old credit card when you get a new one. Don’t do it! Hold on to your cancelled passport. Store it in a safe place – you may want to store it in a different location than your valid passport. Your old passport, even though you can’t use it for travel, is still a useful document. Here are some of the reasons you should keep your old passport. Your cancelled passport is valid proof of your US citizenship. As long as you remain recognizable as the person in the photo on your old passport, it can be used as proof of your US citizenship. If you ever lose your valid passport and need to get a lost passport replacement you can submit a cancelled passport as proof of your US citizenship instead of turning in an original birth certificate. Your old passport is proof of your identity. We hope you never find yourself in the situation of having both your passport and driver’s license lost or stolen, but if you ever do, that old passport can be an important way to prove your identity to get a new driver’s license issued. If your cancelled passport contains visas. It’s very important to hold on to it! Some countries, like India, will allow you to transfer a valid visa from a cancelled passport to a new one. Brazil, which issues 10 year visas to US citizens, will actually allow you to enter the country carrying both a cancelled passport with a valid visa and a new passport. Far more countries, like Russia and Afghanistan, will want to know the details of any previous visas when you apply for a new visa. You will need to keep your old passport on hand so you can refer back to your old visas and make photocopies of them if required. Your old passport is the best travel souvenir! Your passport is a record of all the countries you’ve visited. Flipping through the pages and seeing all your entry and exit stamps is a great way to bring back memories of your trips. It’s also fun to look back at your old passport photos, and what could be a cuter keepsake than “baby’s first passport”?